When hiring a minibus for corporate hire, a team sport, a social outing, a private tour, a day of golf, a bucks/hens party, a graduation celebration, a wedding rehearsal, or any other need price, punctuality, and quality of coach are always main concerns. BusHire.co.nz has a well deserved reputation for providing the lowest cost for all your minibus hire and charter needs. BusHire.co.nz will bring the best value, a friendly driver, and help you customize all your transport. 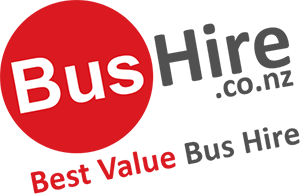 BusHire.co.nz has a large fleet available and can accommodate groups of four and more for all your minibus charter needs. Our minibus coaches are available with standard options and luxury options, to suit all tastes, budgets, and occasions. The smallest coaches available have room for 7 passengers and your private driver. Other size minibuses available for hire are 11 passenger, 13 passenger, 20 passenger, and 24 passenger coaches. Trailers for luggage, sporting equipment, or trade show exhibitions are available upon request. Why use BusHire.co.nz for your private minibus coach hire and charter? There are so many things to see and do in Auckland and the surrounding area. From shopping, to seeing Waitomo Caves, wine tours at the nearby Waiheke Island, harbour dinner cruise, ziplining, or create a custom tour of art galleries, or museums. Eight hour day trips are available, or shorter trips and all come with your private coach and driver to get you where you need to go. Create a custom shopping trip with high tea in the afternoon. Have your driver pick you up from anywhere in Auckland and drive to the Chancery Square to take a walking tour in the square located between the bustling midtown and the beautiful Albert Park . Visit fashion boutiques or treat yourself with delightful cake . When you are shopped out, reconnect with your driver and make your way to one of the fabulous Tea Houses for lunch and afternoon tea. Get out on the water after dark, with a guided kayak your to Rangitoto Island where you can see the city lights from the summit of Auckland’s youngest volcano, or indulge yourself in international flavors at the night markets, where there is also crafts, jewellery and much more to be had, finish it off with a exploration trip of the Southern Hemisphere night sky at Auckland’s Stardome Observatory and Planetarium. Auckland is surrounded with wine land, so why not go on a tour with specialist guide, custom tailored to your requirements, that includes wineries and vineyards on the West Coast (Kumeu, Huapai, Waimauku) as well as the East Coast, Matakana region taking place is some spetacular rural countryside and coastal scenery along the way. Travel safe knowing that your driver will be there at all times to bring you around and back home after the excursion. Bus Charter can provide minibus charter service for just about any type of group sports teams, bands, choir groups, debate teams, student council trips, college tours, and any other sporting or academic competition. Drivers are available for day trips or overnight tournament play. When you have an important event in life such as a wedding, funeral, graduation, milestone birthday, milestone anniversary, family reunion, hen’s/buck’s parties, or rehearsal dinner the last thing you want to worry about is transportation. Especially when some of the guests are travelling from out of town. Getting lost in an unfamiliar city is too easy to do and all these occasions are far too important to risk missing. Allow BusHire.co.nz to assist in all aspects of your transport needs for any and all occasions. Maybe you have a Hen’s party for the girls the weekend before the wedding and no one wants to be the designated driver. BusHire.co.nz will get you and your guests there and back safely. Perhaps you have a rehearsal dinner the night before the wedding and you will need different size coaches to transport guests and or the wedding party between venues. Tell us everything you require and we will work out the logistics that work best for your needs at the lowest cost possible. BusHire.co.nz has a range of vehicles and drivers to fit all your transport needs in and around Auckland. Day trips, overnight trips, short halls over several days. Vehicles with luxury options are available for fancier occasions or more discerning guests, and standard coaches with trailers are available with trailers to transport equipment. Whatever you need a private minibus for we can help you with any all the details. Contact BusHire.co.nz today with your event requirments and we will match the right size coach with the right options for your budget and tastes.